We all needed THAT. After months of listening to lies and insults and feeling nothing but rage, disgust, and fear we finally had our say. For the first time since the election night I saw people smiling again. We didn't seem to mind the pouring rain, the cold, all of the disruptions to the normal life that an event like this brings to a city. The streets were closed, bus service was disrupted—we were all rolling with it, happy that the buses going downtown to the march were too full to take on new passengers. I realize that the new government is cynical and delusional enough not to be moved a hair—not in their emotions nor in their policies—in response to millions of people taking to the streets in the US and the worldwide, but WE needed this march to feel human again. 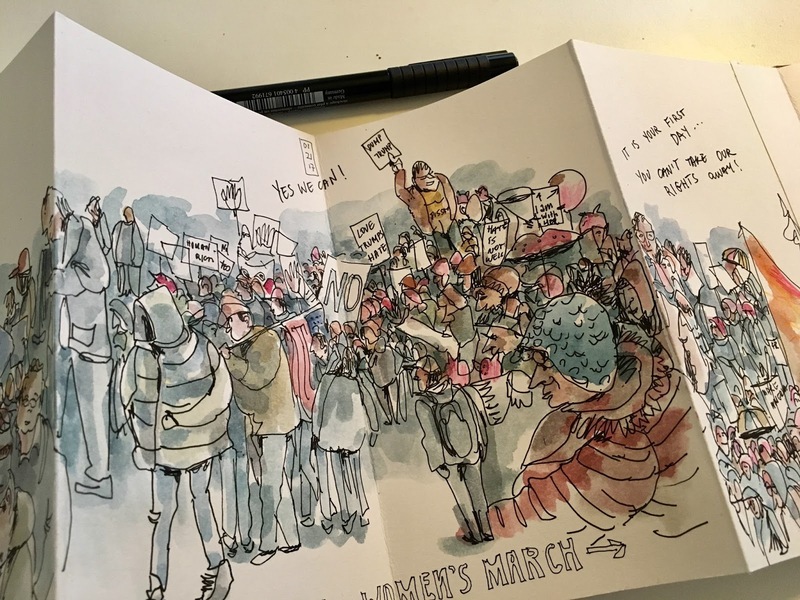 Live sketching of the inaugural day protests in Portland. Drawing at march speed. 100000 people marched under pouring rain this afternoon in Portland alone. Especially moved by all of the men in pink hats.